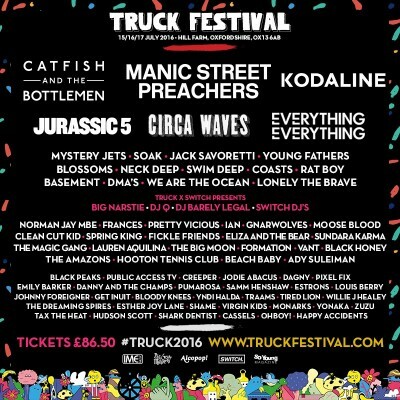 We’ve just been sent one of those email things from the wonderful people of Truck Festival with a massive list of 49 newly added acts including Kodaline, Jurassic 5 and Mystery Jets. We really didn’t expect quite this many to be announced – it’s practically an entire festival in one single announcement! Jurassic 5 are a perfect choice for Truck. Laid back summer vibes with so many songs that ooze soul. With their lyrical genius and funk laden beats J5 first set the bar for hip hop in the Nineties with the release of their self-titled album. Hats off to whoever’s idea this was! Mystery Jets make a welcome return to Truck having played the festival back in 2012. New album Curve Of The Earth was only released a couple of months and you really need to hear the singles Bubblegum and Telomere if you haven’t already. Singer/Songwriter SOAK (real name Bridie Monds-Watson) is a nineteen year old precocious talent who won the Irish Choice Music Prize and was sortlisted for best album at the Mercury Prize with her 2015 album Before We Forgot How To Dream. Just think of how you’ll be able to brag that you saw her back when she was really young! Currently making massive waves around the world are Swim Deep. Drowning in tripped out psychedelic guitars this band is sure to make a real splash at Hill Farm. Check out this amazing satirical video for Namaste from their recent album Mothers. Also announced are Coasts, Basement, Blossoms, Neck Deep, DMAs, Vant, Black Honey, Lauren Aquilina, The Big Moon, The Amazons, Ady Sulieman, Black Peaks, Public Access TV, Jodie Abacus, Emily Barker, Danny And The Champions Of The World, Pumarosa, Samm Henshaw, Estrons, Jonny Foreigner, Get Inuit, Bloody Knees, Yndi Halda, Traams, Tired Lion, The Dreaming Spires, Shame, Virgin Kids, Monarks, Yonaka, Zuzu, Tax The Heat, Hudson Scott, Shark Dentist, Cassels, OhBoy! and Happy Accidents. AND don’t forget that is on top of Manic Street Preachers who will be celebrating twenty years of their seminal album Everything Must Go, Catfish And The Bottlemen, Everything Everything, Circa Waves and many more! Truck is a great festival and this year is sure to go down in it’s history as an absolute classic. Just click HERE to buy your tickets.